What you do in August may very well determine whether your bees survive the Winter or not. and D) protection from the elements. A Good Queen If you started with a package or nuc this Spring, chances are you have a young, Spring-mated queen that will be laying well into September so you should have A & B covered. If you started with a swarm, are working with a colony that has overwintered at least once, or you purchased a proven overwintered queen with your package or nuc (in other words, you have a queen that is 1+ years old), then you should inspect your colony to ensure your queen is still laying well. Queens are at their best in their second year, but her performance may now be in decline. It may be disguised by the natural slowing in Fall, so don't let the normal reduction in air traffic trick you. Observing the hive entrance is an important part of my management style, but you have to go into the hive and inspect because A begets B. Now is the time to go into your hives, to evaluate her laying pattern and to make sure you don't need to requeen. If you aren't seeing any drones then the mating season is over, and if requeening is necessary you'll need to procure an already mated one. If I were looking to buy one, I'd inquire about a Rocky Mountain Reina from Zia Queenbees. Weatherstripping keeps ants from getting to the feed. A Healthy Population Bees only live about 6 weeks during the active season, and only slightly longer during the off-season, so to make it through all the months of Winter ahead, it's good to have young bees at the beginning of Winter. How do you get young bees then? Feed in the Summer! Feeding to stimulate brood-rearing needs to be carefully timed so that you don't do it too soon or too late. If you start too early, the colony could end up with a population that is bigger than stored food will support. If you start too late, then you could have open brood when the cool weather hits. If the cluster of adult bees contracts and can not cover the brood and keep it warm, those young bees will likely die. So when is not too soon and not too late? Right now! I always start Winter preparations with the August meteor shower, the Perseids. (These are the best shooting stars of the year, always mentioned on the evening news so make for a good reminder.) Feed your weak colonies syrup* and pollen to produce "fat" bees that overwinter better. Like a bear preparing to hibernate, somehow the bees convert protein to fat stores. If you don't feed pollen, chances are your bees will just store the syrup, which may give the queen less room to lay in, and then you're going backwards. So feed both syrup and pollen (or pollen substitute). Plan on feeding continuously until the Autumn Equinox. You want to generate a couple rounds of new bees, so that's 6 weeks of feeding, minimum. Outbreeding the varroa mite: According to Maryland beekeeper and queen breeder Mel Disselkoen, "You need 63 days (three brood cycles) from August 1 through September 30 to have a population large enough to overwinter. Remember that a young, newly-mated queen will not slow down that late in the year but will act just like a spring and swarm queen. Therefore, she will outbreed the mite and you will go into winter with a hive of young, strong bees." Adjusting for Denver, aim to produce your 3 brood cycles of Winter bees a bit later, Aug15-Oct15. Incidentally, this is also the time to take action against varroa mite. If you've seen any deformed wings, your bees are suffering from DWV, a virus that gets into your bees via varroa bites and damages your bees. If you haven't seen any deformed wings, don't sit back just yet. With drones being evicted, those mites are going to target your worker bees, and recent research shows that varroa infestation creates neurological damage. We need fat Winter bees with good brains, too. Whether you use powdered sugar, tracking strips, what-have-you, knock those mites down! If your colony seems weakish at all, drone culling is a really good option. Adequate Stores Bees do not hibernate, BTW. They remain active all Winter. The warmer the Winter the more active they will be, and the more food they will consume. Generally, the Fall flow in the Denver area provides ample pollen from aster, rabbitbrush and goldenrod. But nectar is hard to come by with the drought. Keep feeding your light hives syrup, right on into October if they'll take it. ** I wish I could tell you how much honey, exactly, the bees will need. But the answer is a complicated equation of the type of bee you have and the type of Winter you will have. Some bees are frugal, some are voracious. Some Winters are warm, some are cold. What I will suggest, however, is to plan for the worst and hope for the best. Leave at least one super full of honey on your vertical hives, and plan on 2 combs of honey for every 3 of brood in a horizontal TBH. And have an emergency feeding plan ready to implement in February/March. Protection More important than wrapping or insulating your hives is keeping your bees dry. Sure, it's ridiculously dry in Colorado, but it's a different story inside a hive. Honey is moist, open brood is moist, bees respire... condensation is going to form. Winter condensation is a valuable water resource. It's not the presence of condensation that's a problem. It's where it forms that matters. Since heat rises (bringing moisture with it), the ceiling of a hive is your first consideration. Condensation here can drip down on the cluster and chill the bees. If you can't outfit your hive with a ventilation quilt, at minimum insulate your roof to keep your bees dry from above. We lay a piece of wool felt, a sheet of styrofoam or PE foam, and a sheet of bubble wrap on top of our top-bars – somehow this kind of stuff is always laying around – then the inner cover and roof go on. A water-repellent cover is then draped over the hive and secured with bungies, lest the wind blow it away. I made ours out of Sunbrella® fabric. Condensation on the walls can be okay and, as a matter of fact, observation windows give con­densation a place to form away from the ceiling, which is one reason I really like them. Sometimes you will see the bees drinking the water droplets. Mold on the honeycombs is an indicator that there's too much moisture, so watch for it. (The bees will clean it off, if you don't let it get out-of-hand.) If your hive has a solid bottom, be sure to tip your hive ever-so-slightly so the excess water can run down the walls, across the floor and out. It's a good idea to provide some sort of shield from harsh winds, but ideally your bees will have propolized their hive against drafts on their own. *I feed diluted honey, and can't give you a proportion. It's thick enough so that it won't ferment in hot weather, yet thin enough to pour without having to wait for the last drips to drop. **When the weather turns cold, it's harder for the bees to move just to get to it, and also harder for them to ripen the syrup if they're trying to store it. Replace the feeder with a quilt or insulation when they stop taking syrup. Optionally, you can switch it out with a feeder rim or candy board. 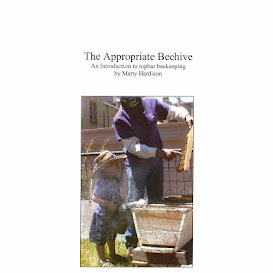 You may also be interested in My Beekeeping Calendar.